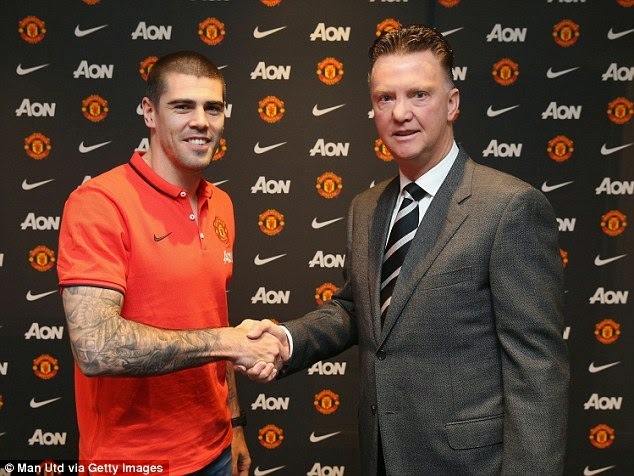 The January transfer window is open and already Manchester Unied have made one new addition with the not so surprising news that Victor Valdes has agreed an 18 month contract to be David de Gea’s understudy! I sincerely hope that is not the only business done by Mr.van Gaal this month as United have a desperate need for new defenders along with at least one quality midfielder. With all the gossip flying around it got me thinking. Which players have United signed in this window in the past? Who turned out to be a shrewd bit of business? Who didn’t fulfill their potential? 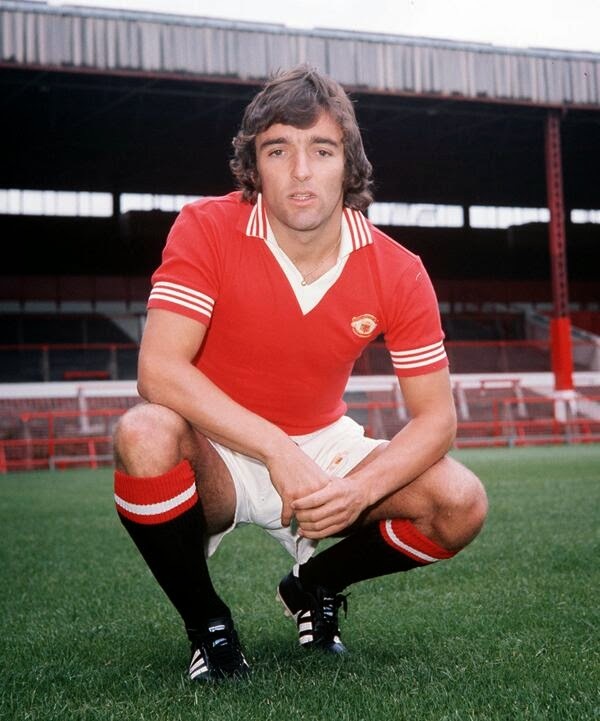 The diminutive Scot arrived at Old Trafford in 1973 from Celtic for a fee of £200,000. Bought by manager and fellow Scot Tommy Docherty he became an instant hit, which continued throughout the seventies and into the eighties. He scored in his first game for United against West Ham United in a 2–2 draw. Nearly signed for Bill Shankly’s Liverpool but fortunately his head was turned United’s way with a little help from Paddy Crerand. Originally bought as a striker, Macari eventually found his niche in midfield. In a team that included Coppell, Pearson, Hill and Buchan, they soon brought United back into prominence after suffering relegation in 1974. Doc’s Army was a team famous for it’s attacking play and kept the tradition of playing attractive football that the fans had been fed on from the Busby days. 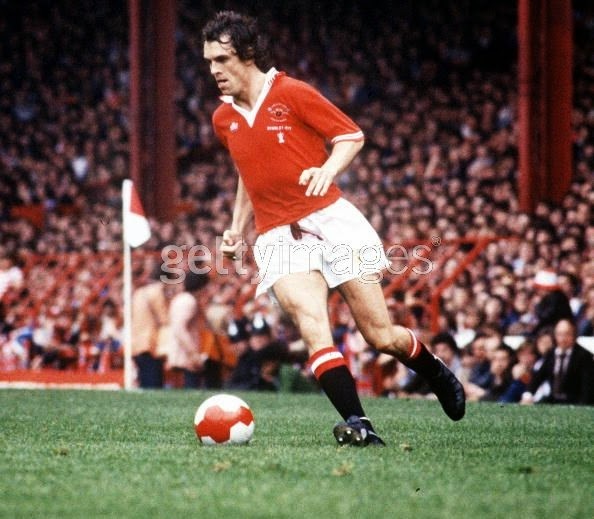 He continued in an attacking midfield position under Dave Sexton and reached the FA Cup final in 1979 only to lose in the last minute to Arsenal. When Ron Atkinson took over from Sexton, Macari spent so long on the bench he gained the nickname of ‘The Judge’. In 1984 Lou left United to enter the world of management. Probably most famous for the shot that rebounded of Jimmy Greenhoff’s chest before entering the Liverpool net to win the FA Cup for United in 1977. Still a fans favourite with his honest no nonsense views on everything United. Nicknamed ‘Jaws’ due to his toothless grin, this hard man center forward terrorised defences up and down the country with his fearless style of play, never afraid to fight for the cause by sticking his head into places it had no right to be. This never say die attitude cemented him as a terrace favourite. With his big team mate from Leeds, defender Gordon McQueen, they gave United a fearsome look. Bought by then manager Dave Sexton from Leeds United for a fee of £350,000 which at the time was a new record for a deal between two British clubs. Although trophyless during his time at United it wasn’t for the lack of trying. He was in the side that lost to Arsenal in the 1979 FA Cup final. Not really at the club long enough to warrant a legend tag, but those who remember him playing will do so fondly. Bought to United at a cost of £6.9 million on 22 January 2002 he is probably the unluckiest striker to have worn the red of United as he took an absolute age to get off the mark. Made a total of 13 Premier League and five UEFA Champions League appearances in the 2001–02 season but did not score. His first United goal, a penalty, came against Maccabi Haifa on the 18th of Sept 2002. In every match the fans were willing him to score or for him to take every penalty. The Stretford End would have sucked his shots into the net if they could have. 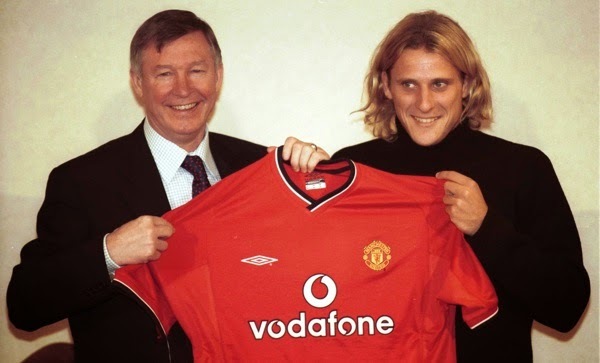 Forlan earned immediate legendary status with a double in a victory at Anfield in December 2002. This was the match that the adoring Old Trafford faithful gave him his own terrace chant to do with the fact he comes from Uruguay and Scousers emotions. In the same season he finished third in the goalscorers charts behind van Nistelrooy and Solskjaer. Ironically when he left United to join Villarreal he smashed records with his goals, Sod’s law really. Signed by Fergie from Newcastle United, where he had a goal conversion rate of 81%, in a deal of £7 million which included Keith Gillespie, valued £1 million, going the other way. This proved to be excellent business for United as ‘Cole the Goal’ went on to head the fearsome attack alongside Dwight Yorke which culminated in the Treble of 1999. Cole played up front in three partnerships of note Cantona, Sheringham and Yorke. 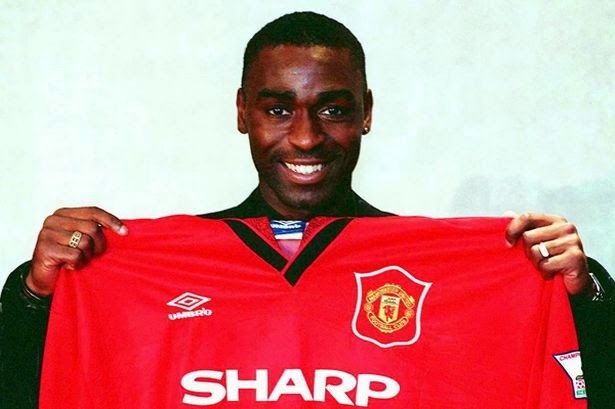 Rumoured to not get on quite so well with Cantona and definitely not on speaking terms with Sheringham, it is his partnership with Yorke that produced Cole’s best results. In the treble season they amassed a total of 53 goals between them in all competitions. The partnership with Yorke proved particularly potent in the UEFA Champions League. Who can forget how their goals dismantled Juventus in the semi final 2nd leg in ’99 on the way to the glorious final. Now working as an ambassador of United. 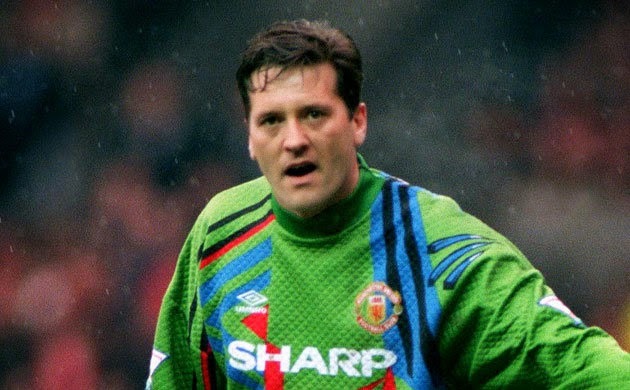 Cheeky Cockney Les Sealey was given his big chance at United when Ferguson dropped No.1 keeper Jim Leighton from the 1990 FA Cup final replay against Crystal Palace. His heroics in goal that evening against an overly aggressive Palace team turned him into a cult hero with all United fans. After the final, ever the true gentleman, Sealey offered his winners medal to Leighton but thankfully the FA intervened and awarded both players medals. His cult status was to get even higher a year later when he kept goal in the 1991 European Cup Winners Cup final against Barcelona. United ran out 2-1 winners and it was his save from Koeman’s free-kick that kept United ahead in the match. Signed on loan from Luton Town he left United then returned in 1993 as back up for Peter Schmeichel but only making a couple of appearances. Les sadly passed away in 2001 of a heart attack at the young age of 43. A great character and underrated for his talent as a keeper. 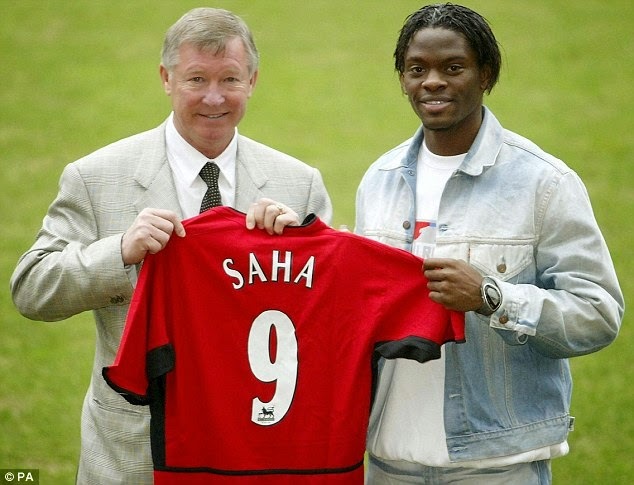 Unfortunately Saha’s United career was blighted by injuries, but when he was fit he certainly knew how to score goals. Saha was transferred to United for a fee of £12.4 million in 2004 having scored 15 goals so far that season for Fulham. Got off to a great career at Old Trafford scoring seven goals in ten starts. The next season was the start of his injury woes especially to his knee then hamstring. He began partnering Ruud van Nistelrooy and then the teenage Wayne Rooney. In 2006 a fully fit Saha was among the goals again and was on a roll. However, the injury jinx returned. When he returned the last time United had a forward line including Rooney, Tevez and a certain Ronaldo. He played mainly from the bench and when called upon did his job. His United career ended when he was sold to Everton in 2008. A quality striker and his love for United was plain to see, it was only the injuries that held him back. Brought to Man United from AS Monaco for a fee of £5.5 million. Evra took his time to settle at the club making his debut in a 3-1 defeat to Manchester City. So poor was his performance in that match Fergie took him off at half time. Fast forward eight years and the Frenchman left United having won almost everything in the game. The only trophy to allude him was the FA Cup. Probably his greatest achievement was winning the double of Premier League and Champions League in 2008. At left back Evra became an important cog in United’s defence forming an understanding at the back with Ferdinand and Vidic. This was the rock that Fergie built his last great teams on. 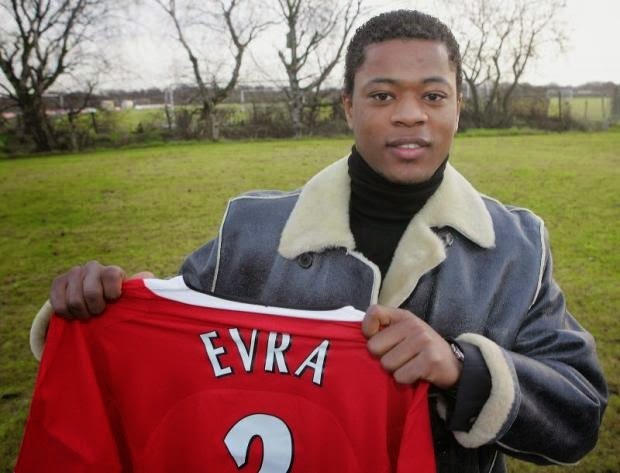 Evra had the honour of captaining United on many occasions and did so with a great gusto. It was a sad day when he departed for Juventus as I’m sure he still had plenty of playing time in him and judging by our current defence his leadership and defensive awareness are being missed. Captured by United from Spartak Moscow for a bargain fee of £7 million at the same time as Patrice Evra. Vidic would go on to form a solid partnership with Rio Ferdinand in the middle of defence that was comparable to the double act of Bruce and Pallister over a decade before. Vidic was famous for his no nonsense tough man approach to defending and was the perfect foil to Ferdinand’s more stylish play. Along with Evra at full back United enjoyed having a defense that they could build another great side upon. Fergie did just that by winning the double in 2008. In his later years at the club he was awarded the captaincy, which was a popular choice with the fans. Again, like Evra he was released to early and could surely have helped the club through the transition period of the last year and kept some much needed stability. Ferguson managed to bring the world class striker from Helsingborg on loan during their league’s off season. What an impact he had. Not so much for his goals but his persona. He gave Old Trafford a buzz and would have been a perfect fit at United as a permanent signing, but he had already given his word that he would return to Sweden after the loan spell. A couple of months after he left United the team went onto win the league and even though he hadn’t played enough games he was awarded a winners medal. His time as a Red Devil was short but sweet. The jury is still out on Smalling who joined United from Fulham in 2010 for an undisclosed fee. Fergie obviously saw something in a player who was playing non-league football for Maidstone United in 2008. Maybe due to the change in management and systems over the last two seasons his performances have not been to the standard expected of himself or a Manchester United player. His place will come under threat should Louis van Gaal purchase a new central defender this month. I’m sure he tries his best and I can’t fault him for that; however, for me his best is not what we have been brought to expect at Old Trafford. 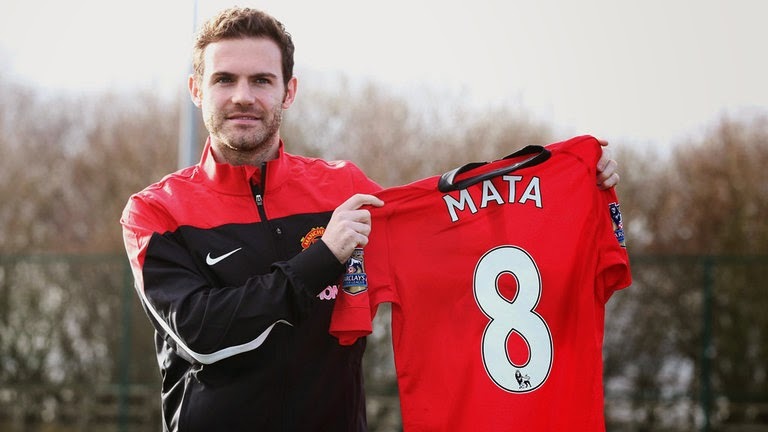 Mata arrived in a helicopter last January from Chelsea for a fee which was then a club record of £37.1 million. With the expectation of being the saviour of Man United and David Moyes the season firmly rested on his shoulders. Sadly, it wasn’t to be as United continued to struggle until the end of the campaign. Under new manager Louis van Gaal, Mata has had ample opportunity to show why he was the fan’s player of the season two years running at Chelsea. He has produced man of the match performances and goals this season and I firmly believe Mata has a valuable part to play in the team. Part of the new wave of Galacticos at Old Trafford alongside Di Maria, Herrera, Falcao, and Rojo. Together I’m sure they will eventually bring the flair back to the Theatre of Dreams. There are the January buys from Manchester United’s past. I hope you enjoyed looking back and let’s see if the next purchases in this or future transfer windows go towards improving the team and become legends. Previous Manchester United 2014 Review Part 2. Next The transformation of Fellaini. Will Eric Cantona Become New Director of Football?